Mehr lives in a world where she is only half accepted. The Ambhan people have conquered and destroyed the Amrithi, and as a woman with parents from both worlds, she struggles to find her place as a worshipper of the old Amrithi gods and traditions. When the Emperor’s mystics take note of her Amrithi powers, they force her into a marriage with one of their own, and Mehr becomes a very important pawn in a deadly game of men, gods, and demons. When I heard “Indian-inspired adult fantasy”, I was immediately intrigued; when I heard “angry, vengeful gods”, I was sold. 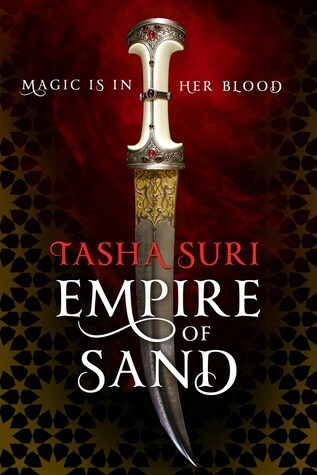 Empire of Sands has been one of my most anticipated releases of the year. I feel like there isn’t a lot of own-voice diverse fantasy in the adult age range, so to see a story so interwoven with the author’s own heritage and experiences as a woman of color, coupled with the inspirations she took from actual history, made this an incredibly fascinating read. She’d always understood that keeping even the barest bones of her heritage demanded a terrible price. But she had kept her heritage regardless. That was her gravest error. Right from the start, I loved the world Tasha Suri has built here. It’s always tough to read stories about conquered nations, knowing what an anchor those themes have in the real world, but Suri goes above and beyond many authors I’ve read tackling similar plots by showing me how awful the Maha and Emperor are and how drastic their crimes against the Amrithi people have been. It’s also incredible to see how strongly Mehr’s Amrithi traditions resonate with her on a daily basis, and how much comfort she takes from her rituals and ancestry. He had never hated her mother’s people. He had just never considered them people at all. They were the kindling wood that fed the fire of the Empire’s strength. I also absolutely loved the daiva, these demon-esque spirits that appear in birdlike forms. There’s an imminent threat present in them from the beginning, but something about their design and the way they interact with Mehr hooked me right away and had me wishing to see even more of them in the story. Mehr knew what it looked like, when another human being stared at her with hatred. What she had seen in Amun’s face was a knife turned inward. Finally, there’s the relationship. In the beginning of the story, I wasn’t quite sure what to expect, but I ended up rooting for Mehr and her love interest so quickly and absolutely swooning over their fleeting, quiet moments by the end. I also can’t help but feel like there’s some very valuable commentary in the story regarding arranged marriages and how they’re not always what western society views them as. How strange, that the world still looked so normal when Mehr’s world was collapsing around her. There’s only one thing I had an issue with, but unfortunately, it was actually a really big struggle I faced while reading Empire of Sand: the pacing. Take this with the knowledge that I love slow fantasy stories, but something about the slow pacing of this book just does not work for me. It felt too tame and like nothing important was happening most of the time; when something important did happen, it was over-explained to the point of losing its power. Even though the writing itself was beautiful, I think it could have been improved by being a solid 75-100 pages shorter. I know that’s a harsh axe to drop, but this book actually put me into the worst slump I’ve had all year (with it now being November). I had to put it down for a week to get over the slump, but when I picked it back up to finish it, it almost put me into another slump! This never happens to me, so despite how gorgeous the plot and characters and setting were, I have to knock off a full star for how slow and meandering it was. Altogether, I really enjoyed Empire of Sand, despite struggling with the pacing. It’s got this incredibly immersive desert setting, these lovable characters, and a backstory that drew me in and didn’t let go. I only wish that I could have enjoyed it more despite the slowness, but I would definitely be happy to try Tasha Suri’s next release, as I think she displays tremendous potential. If you’re someone who also loves slow fantasy—especially if you’re even more patient than I typically am—then I don’t think it will be an issue, but if you’re not one who can handle slow-burning fantasy plots, you may want to try this in audiobook format so you can tune out a little when the tedium kicks in. All quotes come from an advance copy and may not match the final release. Thank you so much to Orbit for providing me with this ARC in exchange for an honest review! Oof. I’ve been very excited to read this, but I find overly slow pacing so frustrating. Maybe knowing about it beforehand will help though. Great review! Thank you! 🙂 I hope it won’t hinder your enjoyment of the story too much! Right! The whole middle part dragged SO badly for me. Did you get any further in it yet? I think you enjoyed this more than me, as I didn’t take to this one as much as I thought I would. I agree the writing is gorgeous though, and I’m with you on your comment about this could have benefited from being shorter. I thought it dragged a little, and I think the pacing was ultimately the factor I disliked the most. But I am curious about the next book, because I think now that the foundations have been established, we can get to the action! I agree completely with you on the pacing being the worst factor. I honestly almost knocked this down to 3 stars, but ultimately realized that I couldn’t justify it with how much I did love the first 75 pages or so. I thought it had SO much potential so I’m very interested in seeing how the second book goes. Love this review Destiny! I may or may not have bought it this month because of the reviews going around 🙂 I’m so stoked for it! I honestly think this would be the PERFECT crossover fantasy for someone who doesn’t usually stray from YA! It actually felt really similar to YA fantasy to me, besides the protagonist being a little older (I want to say she’s 19-20 but I don’t remember for sure). I think, if new adult fantasy was a more widely recognized genre, this would fit the bill well. It’s also not explicit or overly violent like some adult fantasy can be.